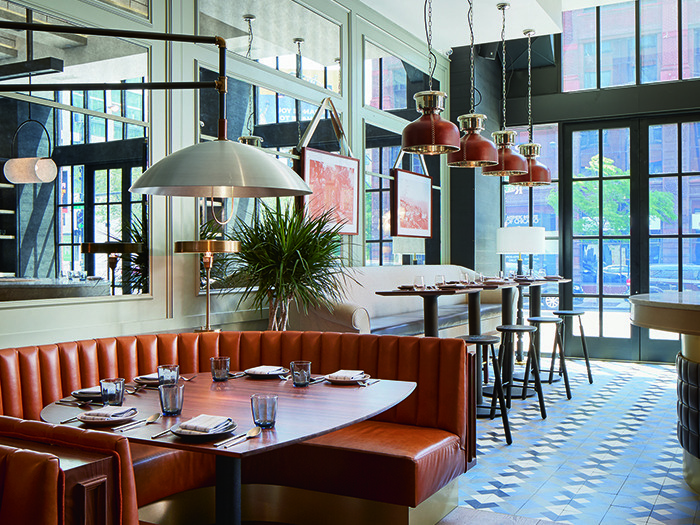 The Proxi Restaurant in Chicago was designed by New York-based design firm Meyer Davis who collaborated with lighting designers Juniper to complete the project. 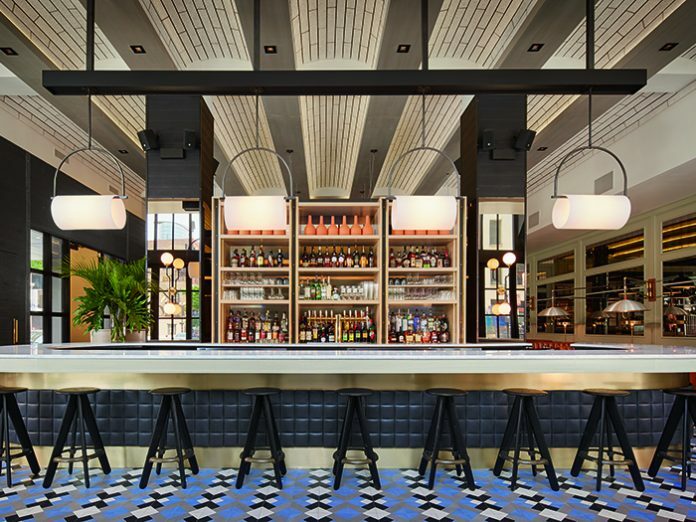 The restaurant is a spin-off of the Michelin-starred Sepia, owned by Chef Andrew Zimmerman and Emmanuel Nony, but with a more casual dining experience. Proxi’s menu draws influence from Asian, Indian, and Mexican cuisines in an unintimidating setting. 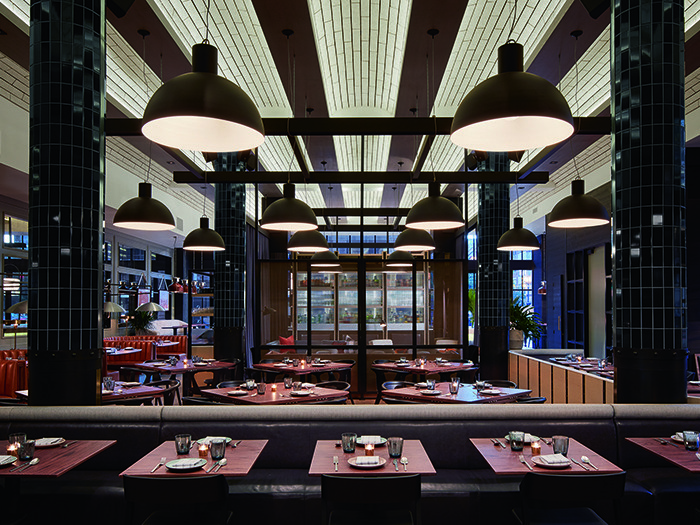 The restaurant’s windowed facade lends itself to a modern-industrial aesthetic and entices passersby to peer in. Once inside, guests are faced with a rounded reception desk which opens up to a large dining area, filled with simplistic wooden tables and chairs. Blue and white tiled floors line the entire space, completing a palette of oranges, blues, and light and dark neutral tones. 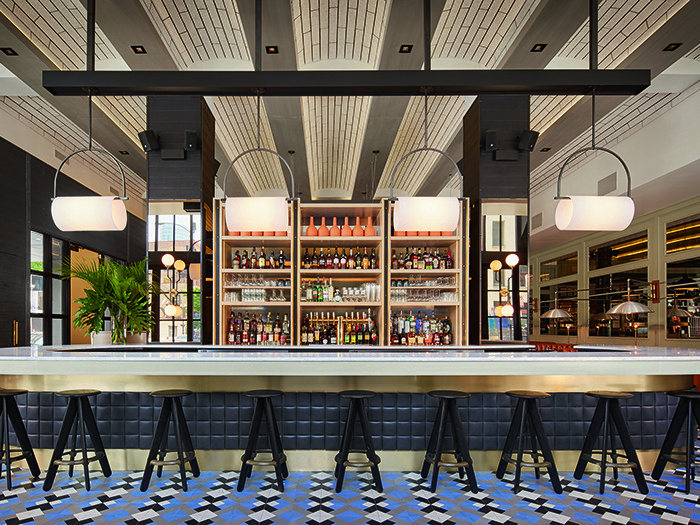 Custom dome pendant lights by Juniper are suspended from beams across the ceiling, aligning with tables in a grid below. The pendants showcase a matte black finish and a white reflective interior to diffuse light evenly. The exterior walls of the dining room are lined with booths to seat larger parties. Adorning the centre of each booth is an aluminium-domed swivel pendant, custom designed by Juniper and Meyer Davis for Proxi. The pendants offer industrial motifs through refined metal finishes, brass pipe joints, and a minimal swivel handle. The custom pendants are then contrasted by natural elements found in camel-coloured leather seating and rich wooden tabletops. With a private party room and lounge area, Proxi offers much more than a relaxed dining atmosphere.